Anne Wafula Strike MBE, provides a personal example of courage, commitment and determination that challenges misconceptions about disability. Athlete, author, and sporting ambassador, Anne inspires achievement and excellence across a broad range of life situations through motivational talks and appearances that encourages others to overcome difficulties and maximise their potential. 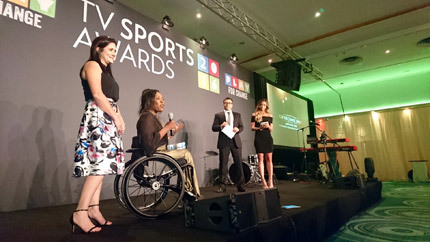 Anne was awarded MBE (Member of the Most Excellent Order of the British Empire) in recognition to her services towards Disability Sport and Charity work at Buckingham Palace. "2012 was a very successful and exciting year with the Olympic and Paralympic Games coming to London. It was a big honour to be one of the 580 people taking part in the torch relay, being one of the ITV London Tonight commentary team, and being at hand for expert insites on Paralympic Games for BBC World TV. Also my debut performance at the Royal Festival Hall / Southbank Centre with the Graeae Theatre Company show - Snowballs and Sequin, as one of Rhinstone Rollers." Be sure to keep checking this page as I will be talking about FORGIVENESS. It is true, that when we FORGIVE, we release negative ties that bind us �and we pave room for a brighter future by freely moving on. Anne embarked on an extra ordinary journey as she tackled one of the most difficult assault courses in the world. Tough Mudder is not for the faint hearted, and it's even more challenging when you are a wheelchair user. With her teams support she tackled the obstacles and completed the challenge. Anne took on this challenge to raise funds for AbleChildAfrica. In My Dreams I Dance is a powerful autobiographical account of adversity, endurance, and accomplishment. A natural storyteller with an excellent command of language, Anne�s journey from Kenya to Britain is punctuated with anecdotes of prejudice, friendship, and motherhood, leading to triumph over testing circumstances. Anne Wafula Strike, MBE, is an excellent motivational speaker who draws on her own life experiences and achievements to inspire her audiences. Anne is not afraid to use humour to get her message across! From contracting polio as a very small child, you learn of the many struggles she had to overcome in Kenya to achieve her first goal of getting an education and going to university to become a first class teacher herself. After the birth of her son, Tim, she took up sport and became a Paralympian within 3 years and had a distinguished career in wheelchair racing, which saw her travel the world to compete against her peers. If you would like to book Anne as a speaker, please click here.